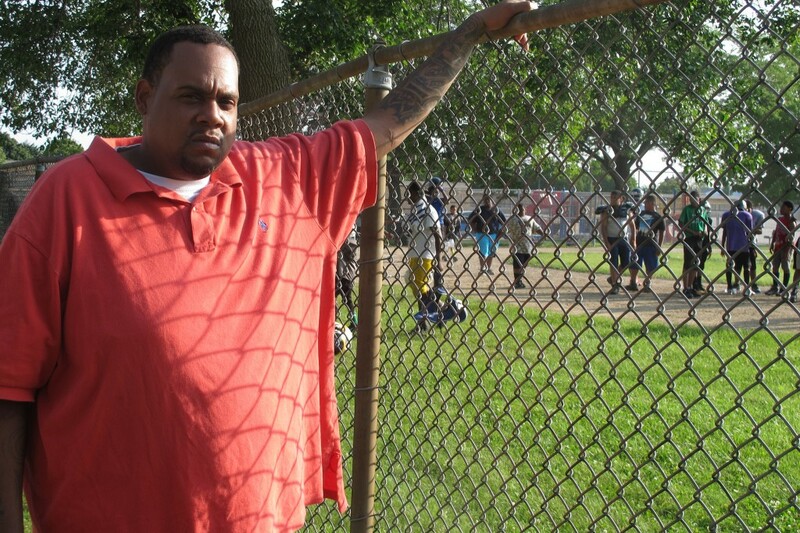 Like many other African American men in Milwaukee, Rodney Hudson is tagged with a label he’ll never shake: he is a convicted felon. Hudson doesn’t claim to be an Eagle Scout — he pleaded guilty at 18 for carrying a concealed weapon and has two marijuana possession convictions — but he says the life sentence imposed by the felony label is too harsh. In Wisconsin, a felony conviction can be the gateway to a life of poverty. Felons don’t qualify for financial aid for higher education, are ineligible to hold occupational licenses, have difficulty finding work and their driver’s licenses are suspended for a minimum of six months. 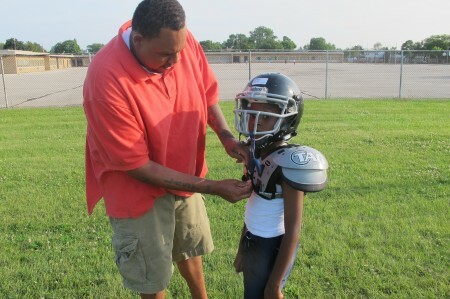 Now 30, and the dedicated father of a 10-year-old girl and an 8-year-old-boy named Rodney Jr., Hudson became a felon not because he committed a violent crime, but because in Wisconsin, a second state charge for marijuana possession is automatically a felony. In two states, Colorado and Washington, it is now legal to possess marijuana, and in many other jurisdictions, it merits only a ticket and a fine. Currently, an individual can be convicted three times for an arguably more serious offense, driving while under the influence (DWI), before the offense is charged as a felony. Hudson tries not to pity himself. He gets up each morning and follows a few job leads, but so far the few opportunities he’s had to find steady employment just haven’t panned out. He recently interviewed at Chick-fil-A, which was hiring workers for its new Greendale and Brookfield restaurants. He didn’t get it. Police have the authority to issue a ticket or a warning instead of making an arrest for marijuana possession, according to Margaret Johnson, racial disparity practice coordinator at the Wisconsin State Public Defender’s Office. In Milwaukee, a first offense marijuana possession charge for less than 25 grams is a citation, but all subsequent arrests are sent to the District Attorney’s office for prosecution, said Lt. Mark Stanmeyer of the Milwaukee Police Department. Police have no alternative other than to make an arrest, Stanmeyer said. But, in Dane County, home of the flagship University of Wisconsin campus, police are known to look the other way when college students are found with marijuana, Johnson said, adding that it’s the same in the Milwaukee suburbs. Marijuana Possession Arrests by Race. In Wisconsin, blacks are six times as likely to be charged with possession than whites, the fourth highest disparity in the nation, behind neighboring states Iowa, Minnesota and Illinois. In Milwaukee County, where nearly 70 percent of the state’s African Americans live, 4.7 blacks are arrested for marijuana possession for every one white, according to the ACLU, which examined data from 2001 through 2010. 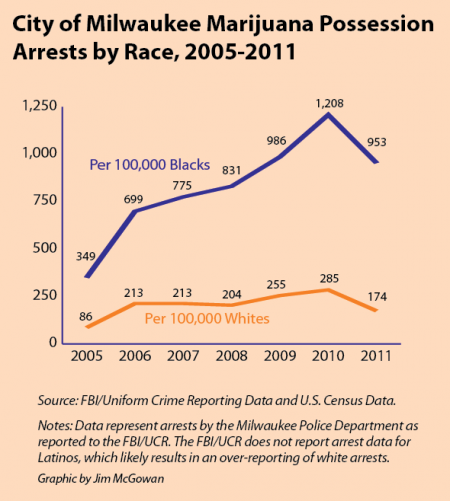 FBI statistics show that in the City of Milwaukee, blacks were 5.5 times more likely to be arrested for marijuana possession than whites in 2011, the most recent year for which data are available. Racial disparity in marijuana arrests is a key contributor to racial disparity in incarceration. Possession of marijuana was among the most frequent crimes charged in the state between 2011-2013 and most of the cases originated in Milwaukee, according to data provided by the Wisconsin Office of the Director of State Courts. According to Chris Ahmuty, director of the ACLU in Wisconsin, once people are caught up in the court system the police are looking out for them, and they’re more apt to be arrested again. “Bad things begin to accumulate and maybe then you end up in prison,” Ahmuty said. 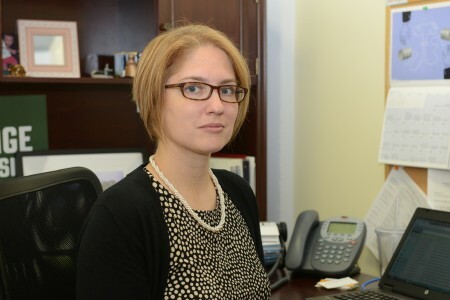 Police on neighborhood beats know who’s on probation, said Jennifer Bias, the deputy trial division director and affirmative action officer at the State Public Defender’s Office. Those who are, “are hammered, they’re arrested; their parole status is taken away,” Bias added. 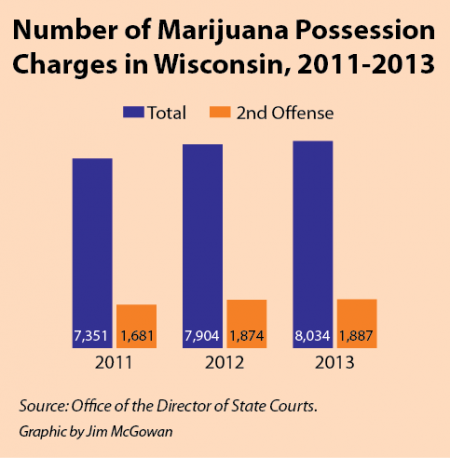 Number of Marijuana Possession Charges in Wisconsin. Wisconsin leads the nation in terms of racial disparity in the prison system, according to a study by the Employment and Training Institute at the University of Wisconsin, Milwaukee. The state’s 12.8 per 100 incarceration rate for black males is almost double the national average and three percentage points higher than the state with the second-highest disparity (Oklahoma), the study found. Most of the offenses are drug-related, and two-thirds of the prisoners are from six ZIP codes representing the poorest neighborhoods in Milwaukee. The hardest hit of those areas is 53206 on the North Side, where Hudson grew up. Nearly 4,000 men from his neighborhood were in prison or had done time between 2000 and 2010, the study found. Legislators have long known that racial profiling is a problem in the state. Gov. Tommy Thompson established a task force on racial profiling in 1999, which released a report in 2000. His successor, Gov. Jim Doyle, commissioned another report in 2008, which made dozens of recommendations, including better data tracking and sharing, education on cultural competency, alternative justice programs, and improved methods to track progress related to racial disparities. Though drugs and drug abuse were mentioned frequently as areas to be addressed, neither report recommended changes in drug-related laws. “We need to rethink how our criminal justice system looks at marijuana,” said state Rep. Melissa Sargent, a Democrat from Madison who introduced legislation to legalize marijuana in January. Sargent said it is egregious that arrests for marijuana possession in Wisconsin are increasing while across the country recreational smoking is increasingly accepted. In Colorado, for example, residents can walk into a shop licensed to sell marijuana and purchase as much as an ounce, while non-residents can buy 1/4 of an ounce. Possession arrests also are extremely expensive, Sargent said, noting that each such arrest costs the state $400 to $500. The ACLU report found that in 2010 alone, Wisconsin spent more than $44 million enforcing marijuana possession laws. Despite increasing public support nationally for legalization, Sargent said she faces stiff opposition from fellow Wisconsin lawmakers, who don’t see any benefits from changing current laws. Many still believe the false narrative of marijuana being a “gateway drug that will ruin our society,” she said. Sargent has only convinced a handful of legislators to sign on, and the governor is firmly opposed. “Legalizing marijuana is not a priority for Governor Walker. As Governor Walker travels the state, this is not an issue he hears about,” wrote Laurel Patrick, a spokesperson for Gov. Scott Walker, in an email to the Milwaukee Neighborhood News Service. Goyke, whose district covers part of Milwaukee, hears a lot about the disparity in how marijuana possession cases are handled compared to driving while intoxicated (DWI), which he considers a more serious offense. Goyke said Wisconsin legislators need to work on parity in the sentencing structure for marijuana possession and other offenses. Last year, he introduced legislation that would make a second DWI conviction a felony. State Rep. Mandela Barnes, whose 11th District is located in Milwaukee, took a slightly different tack last session, introducing a bill that would have made any marijuana possession charge involving 25 grams or less a municipal offense. The legislation failed, not surprisingly, according to Barnes, since the majority of legislators don’t represent areas with a significant minority population. “As long as [legislators] see it as an inner-city Milwaukee issue, a black and brown issue, the less likely they are going to take action on it,” said Barnes, who is a member of the 2014 Legislative Council on the Review of Criminal Penalties. While their white constituents use marijuana just as much as blacks, said Barnes, they’re not as likely to be arrested. Barnes said that for things to change, there would need to be a statewide referendum, or more municipalities would need to decriminalize marijuana on their own. The Washington, D.C., City Council recently passed the “Marijuana Decriminalization Amendment Act of 2014,” which made possession of one ounce or less of marijuana a civil offense subject to a $25 fine. The purpose of the act was to address the racial disparity in marijuana possession arrests and the subsequent toll on the community that the convictions cause. As in Milwaukee, the city’s African American community has borne the brunt of the marijuana laws. In Chicago, Police Superintendent Garry McCarthy is recommending changes to a municipal ordinance enacted two years ago that gave Chicago police the option to issue tickets rather than arrest those caught with less than 15 grams of marijuana. Under the ordinance, people who are caught smoking marijuana in public, or possessing it at Chicago schools or parks or those without proper identification are not eligible for tickets, which prevented it from making any real impact. Most of the individuals caught possessing marijuana in Chicago are arrested rather than ticketed, McCarthy said. He wants police to be able to issue a ticket in all cases involving less than 15 grams, regardless of the circumstances. In Milwaukee, ACLU Associate Director Molly Collins is working on an ordinance similar to the D.C. law. Collins said that statewide legislation to legalize marijuana is unrealistic given the makeup of the legislature, so the solution needs to be local. Collins, who considers marijuana use a health issue, said if the community is serious about addressing the mass incarceration of African Americans, possession must be decriminalized. DUI’s should have harsher punishments… but that’s not really related to the marijuana question. For that I have a simple solution: Unless marijuana becomes legal… don’t use it and don’t possess it. There is nothing in this country that blocks freedom more than prohibition of cannabis. Prison for profit, law enforcement unions, the alcohol industry and big pharm have paid our government to continue the injustice and it is time to stand up and fight for our freedom. The American people are no more free then they were in 1775 we only bow to a new king with a registered trademark. Civil forfeiture of assets in this country is sickening. How does your solution address the unequal enforcement of laws and prevent men of color from having their lives severely hampered by the unequal enforcement? PMD, my solution is a suggestion for any individual who wants to avoid getting wrapped up in this situation at all. There’s a near zero chance of getting a felon for drug possession if you do not possess drugs. I can not even attempt to address the enforcement issue here… It’s an extremely complicated situation. The factors behind drug use and distribution between blacks and whites for example is very different. For example, the relationship between use and distribution for whites is very different than that for African Americans… For whites, using Marijuana makes it more likely that a youth will become a dealer. For blacks, the opposite is true… the relationship is reversed where a youth is more likely to start using b/c they distribute. It’s a weird nuance with big implications. Implications that make sense when you realize things like the fact that a white child receiving some sort of public assistance is less likely than a while youth not receiving public assistance to use Marijuana. Meanwhile, a black youth on public assistance is MORE likely than their counterpart that does not receive assistance. What does this all have to do with enforcement? Something tells me this has more to do with getting caught, and not whether a cop decides to write a ticket vs arrest someone. Also, more whites caught, because of their higher income, probably have a better chance of fighting charges. To top it all off, the users of marijuana in the black community tend to be in higher crime areas that, not coincidentally, have higher police presence and enforcement. So basically they get caught more. This is not an indictment on the idea that enforcing laws should be equal for everyone nor making excuses if/when that happens… my point is simply this, as stated before… regardless of your income, race, location, or any other factor: if you don’t want to get arrested for possession of illegal drugs, don’t possess illegal drugs. The bill I introduced would have required the same repeated behavior of marijuana possession before attaching a felony sentence and conviction. There are several wrinkles to these penalties, for example, when an OWI involves injury or the possession of marijuana is of a very large quantity. Generally, however, the severity of the convictions for OWI versus Marijuana Possession is disproportionate to the severity of the behavior and should be changed. I hope we continue to push this incredibly important issue and see change soon. Thank you, Edgar, for your work on the story! And why is it that more blacks are caught than whites? Because blacks are disproportionately targeted by the police, and not strictly in high crime neighborhoods. It’s true here, it’s true in New Jersey (where I lived briefly, during which time it was big news) and it’s true in Ferguson, Missouri. It’s true all over the country. And blacks are targeted disproportionately despite the fact that in places like New Jersey and Missouri (and Wisconsin? ), whites are more likely to have contraband. So clearly you arrest more blacks for it when they are disproportionately targeted. But does it have to be that way? I don’t think so. We need to stop arresting and locking black people up for petty drug crimes. Drunk driving is a far bigger problem in this state, and I agree with you that DUIs should have harsher punishments. Rep. Goyke, do you believe we should have harsher penalties for repeat DUI’s? Don’t mention a study? What should I offer as evidence? Headlines like that don’t sway you even a little? Story after story from state after state reports similar findings. But I guess that’s not enough to convince some people. Either way Andy, we’re incarcerating way too many black males for petty drug offenses, something that needs to stop. Andy, while Wisconsin is the only state that treats OWI (1st) non-criminally, our repeat drunk driving laws are quite tough. For example, we have mandatory jail sentences on all OWI’s beyond the first and Wisconsin does not plea bargain OWI’s (for example charged with #3, but reduced to #2 through a plea bargain – that doesn’t happen). So, largely, repeat drunk drivers in Wisconsin face tough sentences and I don’t think we need to change them. As we debated a series of different drunk driving bills last legislative session, we heard from several experts that we don’t need tougher penalties to reduce drunk driving, but to increase the likelihood of getting caught. We know that most drunk drivers have driven drunk several times before they got caught and many believe that they won’t ever get caught. There is much debate as to how we effectively do this, which will hopefully be a focus of the Legislature this coming year. Should someone that is caught possessing marijuana twice face a felony while someone that is caught driving drunk twice does not? I knew you’d pull that one out. All that says is that of the white people they stopped, they were more likely. But since it was such a small number compared to numbers of blacks stopped, I think it’s a safe assumption that they were more targeted in their stops of whites. That data does NOT say that whites are more likely to be carrying contraband in general. It’s true for stop and frisk stops. It’s true for traffic stops. But it’s not just about the stops. It’s about the unequal enforcement. What’s the average jail time for 2nd, 3rd, 4th offense OWI? Rep Goyke, I respectfully disagree with your position and encourage you to instead focus on increasing the penalties and making multiple OWI’s a felony. Further, if you are referencing check points, i believe those are no more constitutional than NYC’s stop and frisk policy. Stopping someone without probable cause is in direct violation of the constitution and should not be allowed. PMD, sorry… while I don’t think we necessarily COMPLETELY oppose each other’s viewpoints, I don’t think we’ll ever see eye to eye. So lets just leave it at my first statement. If you don’t want to get caught committing a crime, don’t do the crime. On contraband? Or on unequal enforcement? That statement is all well and good, but it’s much more important to focus on the fact that despite no increase in crime we’ve filled our prison’s with people of color for non-violent drug offenses. Further, in the comments section to several this and different stories on this site you have asked another poster to supply you evidence backing up their different point of view. Once backup was provided, you then either ignore the evidence or claim it is biased before simply continuing to assert the same points. Can I ask why you bother to ask for evidence? I don’t like to come to someone else’s defense on this site, but I don’t think asking for PMD’s source was out of line. The story you site says “the two groups used the drug at similar rates”. The story we’re commenting on makes a similar claim. PMD then asserted “despite the fact that in places like New Jersey and Missouri (and Wisconsin? ), whites are more likely to have contraband”. Given that he’s claiming something different than the other major sources, it’s reasonable to ask where this information came from. He also has a habit of attaching a question mark to points he wants to make without actually making the statement. Additionally, it’s you can’t use the stop and frisk example to show that blacks were unfairly targeted by the program, and then use it to also claim that all groups should exhibit the same signs of over-targeting. By the same logic, if you stop only blue people who are speeding, but stop all green people regardless, it will look like blue people speed more when in reality it’s just unfair that all green people were stopped. It’s definitely reasonable to ask for a source. I do it all the time. But Hereiam did not say it was unreasonable for Andy to ask for a source, so not sure why a defense of him was necessary. Personally, I think it’s a fair point to question why something legal in one state is a felony in another. I also think it’s fair to question why some precincts are more lenient than others, or if there is a racial disparity at a particular precinct. There’s enough evidence that the current system has problems though, and I don’t think it helps to fabricate new issues. What’s being fabricated? And what source is biased, the NY Times? Would you like other sources? NY Times? Is that where your quote in comment #8, defending your fabricated assertion in comment #6, is from? And the fabricated issue is your assertion (in comment #6) that whites carry contraband at a greater rate than blacks. Multiple sources, to include Hereiam’s link to the NY Times and the broken link in the story to the ACLU, claim the usage is roughly equal. Is that not a good enough point that you need to exagerate it beyond what the studies actually show? I didn’t exaggerate or fabricate anything Kyle. That is utter nonsense. Here are examples showing that whites have a higher percentage of contraband than blacks. I found those in two minutes. Nothing was exaggerated or fabricated. All of these articles are about racial profiling in stops. Again, if you stop every black man, and only white men when suspicion warrants, then you’ll have a higher rate of contraband on white men. This data does not show that whites as a population are more likely to carry contraband than blacks. This isn’t supported by anything you’ve presented here. Because it isn’t supported by any study. Your conclusion, stated as fact, is fabricated from your own mind, not any of the sources or data. I didn’t think I needed to add “during traffic stops” or “when being stopped and frisked.” We were talking about disproportionate targeting. I never said anything about the population as a whole. You are misinterpreting what I said. You are fabricating here. Even re-reading your comment, I don’t think the context indicates what you think as clearly as you claim. If that’s all your point was, I don’t think anyone is arguing that racial profiling doesn’t exist, or even that the discretion of officers and prosecutors disproportionately favors whites. From there, I think we could have had a good discussion. But, then you claimed a source shows exactly what you say you didn’t say. But it doesn’t. That link only references Minnesota once, and that study doesn’t show what you say it does. Or at least the synopsis of that study here doesn’t claim that. Like all the other racial profiling studies, it shows that whites were more likely to be stopped for cause, and less likely to be stopped in general. Where is Bruce Thompson when you need him? Kyle… I don’t think they understand that the stats on whites with “contraband” are higher during stops because they are more targeted while stats on minorities with “contraband” are deflated due to profiling. That is all I meant. I certainly know what I intended to say. If it wasn’t as articulate as it could have been, well, that’s a possibility. I was looking up studies as quickly as I could and typing fast, and I rarely go back and look over what I write before hitting “Post Comment.” I’m also guilty of getting off track. I intended to focus on the problem of filling up prisons with black males for non-violent drug offenses, and the urgent need to change that. I can appreciate that. I also rewrote my message here several times but really this is too complicated of an issue to hash out on a comments section of a blog. But it doesn’t really matter… I’ll always give the same advice to anyone who will listen. If you don’t want to get convicted of a crime and suffer the consequences of your actions, don’t do the crime. I see your point. That’s fair advice Andy, but it sort of reminds me of the abstinence-only crowd and their arguments. In an ideal world, teenagers will make only smart choices about their sexual relationships, and people won’t smoke or possess marijuana while it’s illegal. But neither is realistic. Better to focus on reality.